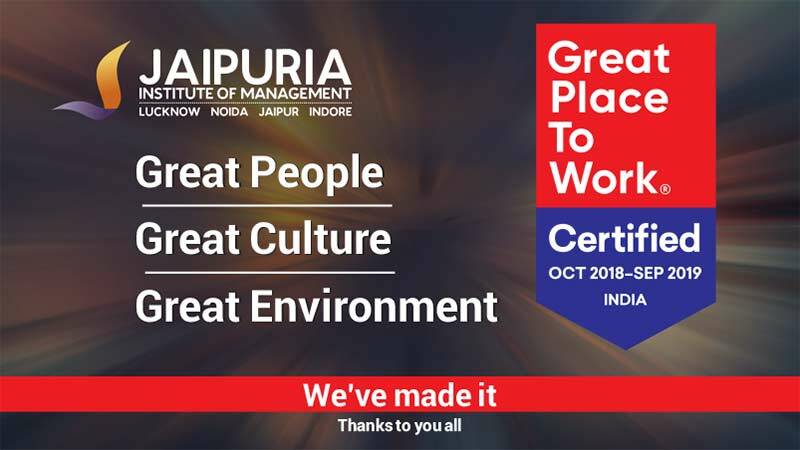 Jaipuria Institute of Management has been recently acknowledged as a “Great Place to Work” by the Great Place to Work Institute, a global management research and consulting firm dedicated towards enabling organizations achieve business objectives by building better workplaces. The assessment methodology involved a thorough assessment of People Practices within the organization and had the institute survey its employees across 56 statements. The model monitors employees’ perception about their workplace and the survey gives the organization its- Trust Index by evaluating: a. Credibility of Management, b. Respect for People, c. Fairness at the Workplace, d. Pride and, e. Camaraderie between people at the workplace. Jaipuria Institute of Management scored a straight 77 on a scale of 100 on Trust Index. Every year, more than 10,000 organisations from over 58 countries partner with Great Place to Work® Institute for assessment, benchmarking and planning actions to strengthen their workplace culture. In India, more than 600 organisations applied to Great Place to Work® Institute to undertake the assessment this year, making it the largest Study in the space of Workplace Recognition. Jaipuria Institute of Management is the only B-School and college who has been certified as a Great Place to Work, 2018. Among the other mid-size organizations to have received the recognition from India includes- Franke Faber India Pvt. Ltd., Mattel India, SEWA, De lage Landen Financial Services India Pvt. Ltd., Interra Systems India Pvt. Ltd., to name a few. Jaipuria Institute of Management operates from four cities- Lucknow, Noida, Jaipur and Indore with its Head Office being located in Pusa Road, Delhi. The institute has approximately 264 employees ensuring the growth of the organization and supporting it to continue being one of the premier B-schools of the country. Among a plethora of employee engagement initiatives, few of the latest ones include- POSH (Prevention of Sexual Harassment) Training, Faculty Development Program, Skill & Management Programs, Yoga Sessions, Recreational activities, Monthly Birthday Celebrations, PRP – Performer Recognition program, IDP – Individual Development Program and at last Advance Planning for Retirement which is offered from mid-career for judicious planning of post retirement life. 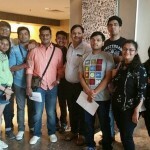 Budding managers at Jaipuria Lucknow excited after interacting with captains of industry.